The LL10 Progressive Cavity Pump is sized for pumping thickened flow mediums such as latex-based fluids and thickened coatings such as plaster or grout. The LL10 Flow rate of (18.8 gallons/100 revolutions) from 15 up to 140 GPM and represents one of our most popular heavy duty models of Progressive Cavity Slurry Pumps. 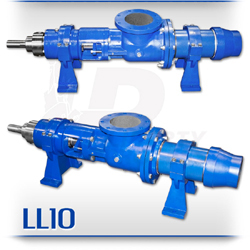 The LL10 unit is a low-cost, maintenance free, dependable drop-in replacement pump for other popular “L-Frame” slurry-pumps such as *Moyno® L series, *Tarby® Century 3 Series and *Continental® CL Series® and the replacement parts are dimensionally interchangeable with the mentioned OEM Brands. The LL10 is a standard flanged pump design manufactured with high strength cast iron or 316 stainless steel pump casings and designed in 1, 2, and 3 stages for 75, 150 or 225 psi discharge pressures with a simple hardened pinned joint drive assembly. The LL10 Rotors are typically hardened tool steel or 316 stainless steel with a hard chrome plating for long life in abrasive pumping applications.